Your objective is to become the World Karting Champion, by mastering the controls of the 125mph kart. You play as an international Kart driver with your ultimate goal being to progress through 3different championships and classes, in order to win the definitive 250cc championship ! Oneobjective : to win races ; with this comes experience and money to upgrade your kart. 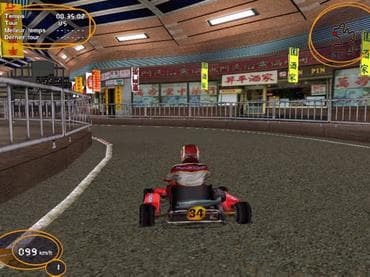 An excellent driving discipline and a true racing simulation: the driver has to drive fast but alsoto correctly set his kart up; to buy new mechanical parts, to repair them and to please hissponsors… He has to perform as a team manager and to drive cleverly in the hope winning the world title. Free Game features: - 20 international circuits in 10 countries; - 3 classes of karts with unique handling: 100cc, 125cc and 250cc; - A complete Career mode; - An Arcade mode: no settings just race and go; - A Time Trial mode; - Many settings: tires, engine, brakes, etc. ; - Customisable karts; - Variable weather conditions. If you have questions about Open Kart game, please contact us using this form.